Multimatic is a leading supplier of engineered components, systems and services to the automotive industry. Specialising in the engineering and manufacturing of complex mechanisms, body hardware, suspension systems and body structures, they also design and develop lightweight composite automotive systems. Based in Canada, Multimatic has manufacturing divisions and engineering facilities all over the world. 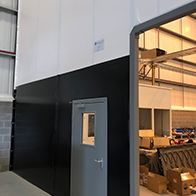 Multimatic required Westgate to install an additional Flexiwall with the purpose of extending a previous Flexiwall installation from 6 years ago at a facility at Chase Point, Coventry. Flexiwall offers a unique method of partitioning as it is easily reconfigured, relocated or removed. The main function of the partition was to create a clean work area, separated off from the rest of the factory. 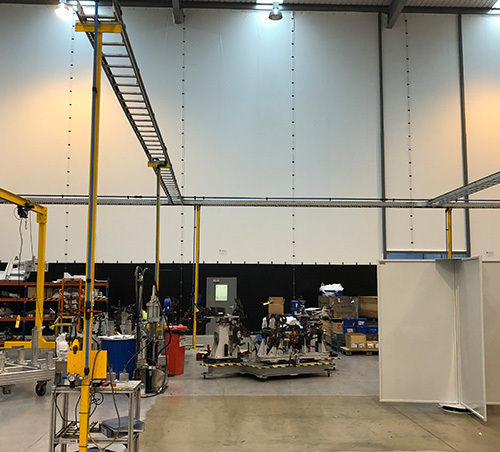 The over 99% dust tight seal that Flexiwall provides means that the work area can remain clean and free of any dust or dirt that may be generated by processes elsewhere in the factory. The Flexiwall enclosure was 24 metres wide and 12.3 metres high. Topped with white fabric, Westgate suggested a black heavy duty fabric bottom section to provide extra resistance against accidental damage. As well as the Flexiwall, a roller shutter door and two pedestrian doors were installed for access. Westgate suspend and tension each panel to form a permanent but relocatable wall so that in the future the enclosure can be enlarged, reduced or even moved if necessary. Flexiwall enclosures only require minimal floor space to be installed to make the most of the existing space available, and can even be installed in tight spaces. 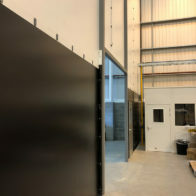 Another benefit of using Flexiwall to create enclosures is that the system is extremely quick to install which saves on business downtime and additionally, the installation creates less dust and mess compared to other more traditional partitions.